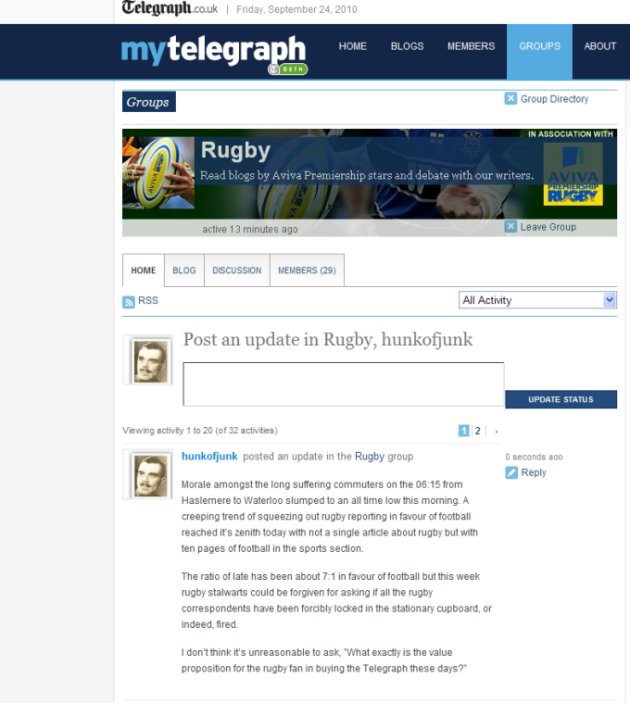 A couple of weeks ago I wrote about the pitiful rugby coverage in the Daily Telegraph of late. It hit a nadir today with no coverage whatsoever, but the Telegraph didn't let us down; they gave us another 10 pages of soccer. Somewhat deflated, I stuck a comment on their blog this morning to try and elicit a response from a journalist.......... that was five hours ago. I joked about the rugby correspondents having been locked in the stationary cupboard............ perhaps thay have because there still doesn't appear to be any life on the rugby desk. Maybe they decamped to the pub....... one things for sure, they're not writing about their core constituent readers favourite sport. Haven't had a reply yet............. obviously.